In the fourth week of a partial government shutdown that has left more than 800,000 federal employees furloughed or working without pay, there's at least one tiny consolation: Free beer. As the shutdown stretches on, communities and industries across the nation have rallied around affected workers. Pop-up food banks are giving out supplies, restaurants are feeding employees for free and banks are offering low-interest loans. Other efforts, like the Harlem Globe Trotters offering free tickets, have tried to build morale among employees who missed their first paycheck last week. Now anyone can offer a little encouragement to a government worker, at least within the District of Columbia, by buying them a beer. "Beers available NOW," reads the Pay It Furloughed website. As of Wednesday evening, more than 1,400 free beers were available to furloughed and unpaid federal workers, with over 260 already consumed. Both numbers were rising steadily into the night. Nevin Martell, a food writer, started the venture over the weekend with Al Goldberg, founder of culinary incubator Mess Hall. Martell tells NPR their goal is to facilitate "a small human gesture" over long distances. "If you were sitting next to someone in a bar, and they were complaining about having a bad day at work because they were forced to be there without being paid, or they were stuck at home because they were furloughed, you'd probably say 'Hey, next round's on me!' " Martell says. One beer, tax included, comes to $7.50 for donors. Anyone over 21 with a valid federal I.D. can claim the beers at four partners: Atlas Brew Works, DC Brau, Shop Made in DC and 3 Stars Brewing Company. Pay It Furloughed says it has raised over $10,000. 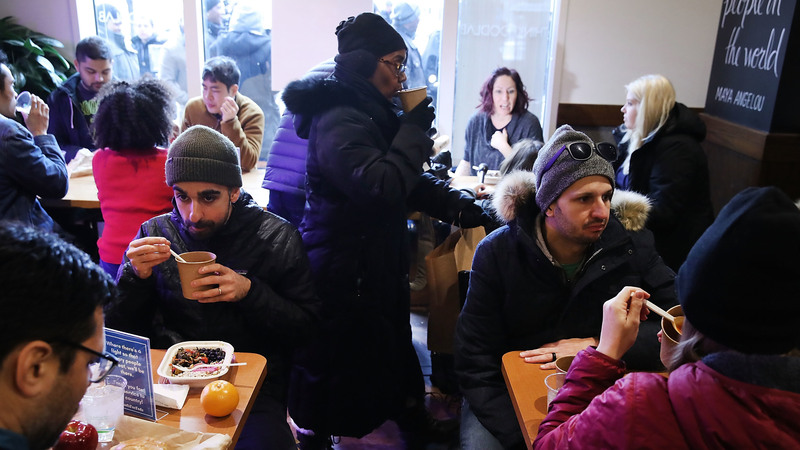 The prospect of a free beer might bring little relief to more than 100,000 D.C. federal employees affected by the shutdown, especially those who are struggling to pay mortgages and worried about where their next meal might come from. But Martell says the initiative doesn't just aim to cheer up workers. It's also intended to support local businesses with economic ties to the government. Washington Mayor Muriel Bowser says the partial government shutdown has had "immediate impacts" on the city's economy, as federal workers and contractors continue to go unpaid. "People not working means they're not using the Metro, they're not using rideshare, they're not using services," Bowser told Here & Now earlier this week. Justin Cox, founder of Atlas Brew Works in northeast D.C., says his brewery has felt that impact. "We've seen a slowdown in our sales in the taproom and our distribution ... around D.C.," he tells NPR. "People are tightening their belts a little bit. They're spending less time going out to eat and on leisure activities like craft beer." The brewery is also waiting for government to reopen so the Alcohol and Tobacco Tax and Trade Bureau can approve labels for a new beer sitting in a tank in his taproom, which can't be packaged until it gets that approval. But he says Pay It Furloughed has at least helped stem his company's losses. So far, Atlas Brew Works has served close to 90 beers under the program. Rachel Murray, a bartender at Atlas Brew Works, says she's seen an influx of people in the past few nights, which is unusual for a week with both a shutdown and a snowstorm. She's been bartending for 13 years, and she says what happens on Capitol Hill often affects local businesses. Pay It Furloughed "has definitely has brought in more business this week," she tells NPR. "People have been coming out who have been stuck inside and have cabin fever, so it's nice for them to come out and get a free beer." And, she adds, most of the federal employees have been generous tippers.